Rosehip would like to invite you and yours to apply for our upcoming training, April 5th, 6th and 7th 2019 in Portland, OR. Read on for description (same as in the application form). This training is designed to prepare street medics (aka action/protest medics) to provide first aid and spread calm at protests, encampments, and all sites of resistance. Participants are asked to attend the entire training (Fri: 5-9pm, Sat & Sun 9a-6:30p). It will take place at a centrally accessible location on major bus routes, with wheelchair accessible bathrooms and teaching space. We are continuing to develop a new application and registration process. Our goal is to streamline the process while prioritizing limited spots for BIPOC, queer and trans folks, people with disabilities and activists working towards collective liberation. We are asking for a brief written application* (https://goo.gl/forms/yFjSOkPXPhj9gnR32) and will notify people if you are being offered a spot in the training. We will close applications at the end of Saturday, March 16th; please return this email/respond before then! We offer 20 hour street medic trainings several times a year. Our trainings are open to people of any skill level and many kinds of abilities; we encourage physicians, herbalists, & EMTs to attend our trainings as strongly as we do people with no first aid or care work background. Our trainings are comprehensive, focusing on preparation, actions, and aftercare–and participants leave with tools useful for medicking at every major summit protest and with friends, family, and neighbors. Our trainings are intensive, with one evening session and two long days, and include a lot of hands-on practice and realistic scenarios. We strive to make our trainings accessible, safe and supportive for all people, and will work with you beforehand to make sure your needs are met. * If filling out this form in writing doesn’t meet your needs, please send us an email (rosehipmedics@gmail.com) with a phone number and we can contact you to take your application over the phone. **If paying this would represent a significant financial hardship/barrier, please let us know and we can discuss other options. 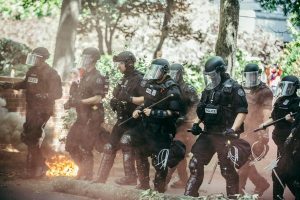 PORTLAND, OR: On August 4th, Rosehip Medic Collective and a network of allied street medics treated multiple injuries caused by police projectiles and chemical weapons during a three-way confrontation between police, anti-fascist counter-protestors, and Patriot Prayer—a far-right group that includes Proud Boys, known neo-Nazis, and KKK members. All injuries treated were sustained by anti-fascist demonstrators. Medics observed unprovoked police attacks on anti-fascist protesters, treating several demonstrators (including one medic) with injuries to the upper body and head by low-flying projectile weapons and explosive canisters. At least 3 required more intensive care and were sent to area hospitals. One was an anti-fascist demonstrator struck in the head by a 2.5-inch wide police projectile which passed through his helmet causing a serious head injury that would have almost certainly been fatal without the helmet. Many more were treated for injuries from pepper spray, pepper balls, and physical violence at the hands of both police and Patriot Prayer or Proud Boy members. Street medics have provided medical support to protesters and frontline communities since the Civil Rights movement and have responded to an increasing need since the 1990s. Rosehip Medic Collective has been active in the Portland area for over 10 years, and has trained hundreds of street medics in an intensive 20+ hour training specifically designed to teach people to care for people injured at protests. This training includes response to law enforcement tactics such as chemical weapons and projectiles, basic and lifesaving first aid, medical ethics, and a focus on consent-driven, patient-centered care adapted to the street environment. 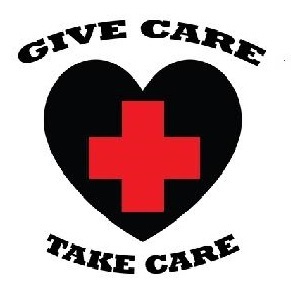 Many street medics maintain nursing, physician, EMT, WFR, and other medical certifications, in addition to the extensive training offered by Rosehip Medic Collective. Rosehip Medic Collective usually does not respond to media requests, however given the serious injuries witnessed this weekend, at this time we can be contacted by email for further information, statements, or interview requests.